On 22 February, the fifth edition of the Top Utility Analysis took place in Milan, which this year focused on the contribution of technology to the growth of the urban fabric: "Public Services and innovation - the technological challenge". The prize is awarded to companies with the best performance, from the 100 Italian utility companies considered by the study. A2A won the Top Utility Communication prize, reserved for companies that, more than others, have been able to communicate their business through traditional media and the web. Top Utility Communication rewards the best case of communication, taking into account the different channels (advertising, online, print, etc.) and the various areas (communication to customers, financial, environmental, social, etc.). On Wednesday 5 July, A2A received the Corporate Social Responsibility Award in Milan, during the fifth edition of the TopLegal Corporate Counsel Awards 2017, awards for the best legal teams, Tax, Compliance, General Counsel, Tax Directors and Human Resources in the main Italian companies. The award, established in 2015, appreciates the companies that effectively manage social and ethical issues within themselves and in the geographical areas where they operate. The Technical Commission, composed of authoritative General Counsels and Directors of Legal, Tax and Corporate Affairs of Italian business and finance, explained that the award was given to our group because, "since 2015, A2A has begun, the first in Italy to do so, to publish sustainability reports based on specific territories where it operates, undertaking a process to approach the territories and extend its stakeholder involvement model. In 2017, A2A was a finalist for the Abis Sustainability Award 2017, an international award that recognises initiatives and projects aimed at contributing to the achievement of SDGs. A2A is a candidate with the process developed for the construction of its sustainability strategy, focusing on the definition of the Policy and Sustainability Plans, in line with the UN 2030 Agenda, and the integration of these with the Business Plan and goals. A2A was nominated by Unioncamere Lombarida for its “2015 corporate good practices” and was awarded a prize for all categories: environment, job, civil society, markets and corporate governance. The merit for the award certifies that the company developed social awareness good practices for: environmental sustainability, quality of work, and staff relations, initiatives towards civil society and Local Communities, quality of the relationship with customers, consumers and suppliers and responsible management of the company. In particular, it was also nominated for the excellent level reached in the communication of social awareness practices implemented through its Sustainability Report. A2A was thus included in the Good Practices List in Lombardy (Repertorio delle Buone Prassi in Lombardy) which is a communication, transparency and sharing tool intended to spread good practices in Lombardy and to help the imitation imitation process in the business community. A2A received the "CEEP-CSR Label", a prestigious award awarded to public utility companies that have distinguished themselves in the application of best European standards and sponsored by the CEEP - (European Centre of public utility companies) in Brussels. The "CEEP-CSR Label" is a trademark created to reward companies that have been able to integrate, on a voluntary basis, the Corporate Social Responsibility- CSR into their business practices. A2A was awarded for three projects of excellence: the Observatory on unfair commercial practices, launched in November 2011 in cooperation with the Consumers' Associations, which has gradually been implemented in important initiatives (from the Protocol of self-regulation to the Joint Committee A2A Energia/Consumers' Associations); the project Smart Domo Grid, developed in the Villagio Violino in Brescia, which hinges on the use of smart grids; the environmental education project “Raccogli, trasforma, crea” (Collect, transform, create) organized by A2A Ambiente in collaboration with the associations ACSSA, Adiconsum, Amici della Terra e Lega Consumatori. The Italian Ecolabel-Ecoaudit Committee awarded the 2014 EMAS Italia Award to the Edipower plant in Sermide (Mantua). This award is reserved for EMAS registered organizations that have best interpreted and applied the inspiring principles behind the assessment tool created by the European Union. The 2014 edition of the award was dedicated to Eco Innovation, i.e. the ability to reduce environmental impacts through the development of new products, techniques, services, processes and business models that create environmental benefits. In addition, at the prestigious European EMAS Awards 2014 different Italian organizations wanted to get involved by sending their application, to prove their value and ability to innovate. The Sermide thermoelectric plant of Edipower, A2A Group company, was one of the three Italian organizations that excelled in the 2014 European competition. In the 12 years that the plant in Sermide has obtained EMAS registration measures have been taken for safety and the environment (more than 100 targets all completed), amounting to approximately 416 million euro, for the most part aimed at reducing atmospheric emissions. These include 360 million euro invested for the conversion of the plant from fuel oil to combined cycle fed by natural gas, which allowed greatly reducing emissions of nitrogen oxides and carbon monoxide and completely eliminating emissions of particulate and sulfur dioxide. Another 54 million euro were allocated to change the gas turbines to further reduce emissions of nitrogen oxides. Also important is the investment for the savings of water resources: with a recirculation system which allows reusing cooling water in the 2011- 2013 period, 70.8% of the water previously used was saved. In 2013, A2A was selected by Unioncamere Lombardia for “Best Business Practices” and given the “Best Practices Make Big Companies” award for our demonstrated commitment in projects related to environmental sustainability, work quality, and employee relationships, as well as our community and territory focused initiatives. A2A has joined the Lombardy directory of best business practices to set an example and encourage more companies to follow suit. In 2013 A2A Calore & Servizi achieved certification as an ESCo (Energy Service Company) according to UNI CEI 11352:2010 for the provision of energy services in the public and private sectors. This certification is in addition to its recognition in 2005 as a company operating in the promotion, installation and management of measures for the reduction of energy consumption, in accordance with the Ministerial Decree of July 20, 2004 and AEEG. Resolution 103/03. This is a new milestone for A2A Calore & Servizi in terms of certification, placing the company among the first in Italy to have this type of validation, showing its technical capacity to operate in the energy analysis sector and to manage contracts with guaranteed results for the energy savings achieved. The operators of cogeneration plants, including those using heat to feed district heating networks, can make an annual application to the Gestore dei Servizi Energetici (GSE) for the award of High Efficiency Cogeneration (HEC) status. This recognition is awarded when there is a Primary Energy Saving (PES) of at least 10%. A2A has been awarded High Efficiency Cogeneration status for the cogeneration units of the plants in the Milan area (Tecnocity, Famagosta, Canavese, Novate, Cassano d’Adda and the Silla 2 waste-to-energy plant), the Bergamo area (Carnovali and Monterosso), Varese (Circolo Hospital) and Brescia (Lamarmora and the Brescia waste-to-energy plant). All these plants feed urban district heating networks managed by A2A Calore & Servizi. In 2013 A2A Energia was awarded the prize for the “Cloud Innovation Award” by the School of Management of the Politecnico di Milano for its “Sales Force Automation”. A2A was the winner for “support to the commercial development strategy based on integrated management of the sales processes” of electricity and gas on the mass market segment (domestic and micro-business customers), through a single application that also includes mobile sales support solutions. The final phase of the prize, now in its second edition, included the participation of more than 100 companies and is awarded to companies that have shown a capacity to innovate their processes or the ICT infrastructure through “Cloud” based tools, which is IT speak for “centralized and virtual” at the same time. On May 14 at the tenth Sodalitas Social Award “Know the environment and energy”, the TV quiz show created by A2A, was awarded finalist for the Environment category. The object of the quiz was the wish to involve and inform the younger generations, primary school students (fourth and fifth) and secondary schools at first level, how important it is to understand what the environmental and energy urgencies of our planet are and how many there may be. Through this TV format A2A takes the opportunity to attract young people, on issues ranging from environmental and territorial protection, to energy saving through district heating and waste. The programme to date has seen the participation of 40 schools in the areas of Brescia and Bergamo. A communication project that confirms how important it is for the A2A Group to be able to relate, also through this sort of initiative, with the territory within a framework of cooperation and social responsibility. The details of the project and the results achieved by "Know the environment and energy" are published in the special edition of the Golden Book of Corporate Social Responsibility of the Sodalitas Social Award which collates the 253 applications submitted by 199 companies. 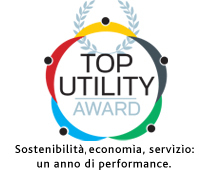 Hera, Enel, A2A, Smat Torino and Marche Multiservizi are the names of the companies that were awarded the Top Utility Award, the acknowledgement of Italian excellence in the utility sector. The prize was awarded on October 23, 2012 in Rome during the conference “Le utilities per lo sviluppo economico e sociale dell’Italia. Le eccellenze dei servizi pubblici per la rinascita del nostro Paese” (the utilities for the economic and social development of Italy. The excellence of public service for the rebirth of our Country). Subject of the study were the top 100 Italian companies of energy, gas, water and waste. Scholars of the consulting firm Althesys, led by the scientific director of the award, Alessandro Marangoni, analysed and benchmarked companies on 180 parameters, grouped into five main areas: economic and financial results of the three-year period 2009-2011 period; operating performance in the various sectors; quality of commercial services; environmental and social sustainability; communication. Researchers painted a picture of a thriving universe, able to provide jobs for 130 thousand employees with a total turnover of 111 billion Euro in 2011, despite the crisis; it has continued to invest 2.7 billion. The first ten tricolour utilities, says the analysis, have performance comparable to the big European players. The public services as a whole have invested 0.2% of GDP in technology and innovation. "Our valuation model (VIP- Valutazione Integrata delle Performance) [Integrated Performance Evaluation] - stressed Marangoni - pays special attention to social and environmental sustainability. A2A has shown excellent results on the environmental and CSR fronts. The strong share of renewable energy due to 'hydropower has an important role, but it is the set of data, also highlighted by their relationship to sustainability, that was the key factor. In detail, A2A stands out for the efficiency of the production processes (less resources used), for its efforts towards its employees (training and safety in the workplace), for the attention to environmental and social issues (no penalties for environmental violations, and extremely accurate and precise sustainability report)". On 20 June at the conference "The economic benefits of sustainability in a successful enterprise - perspectives, tools, benefits of certification,” A2A-AGSM Verona, AbruzzoEnergia and Ecodeco were awarded the Certiquality Excellence Award 2011. This Certificate of excellence testifies the commitment to corporate governance by effectively integrating environmental management systems in the field of Quality (ISO 9001), Environment (ISO 14001, EMAS), and Safety (British Standard OHSAS ISO 18001). During the ceremony, the President of Ceriquality Ernesto Oppici pointed out that "In Italy, with over 120,000 locations certified for quality, there are approximately 14,000 environmental certifications and just over 4,000 for safety in the workplace. To date just over 250 companies are in possession of this recognition of Certiquality, and this represents a virtuous and avant-garde niche." Luigi Guarrera, the Director of Quality, Environment and Safety of A2A received this important recognition on behalf of A2A. Convegno Progetto ContAgioOn 14th June 2010 the prizes were awarded for the Sodalitas Social Award in the Assolombarda Auditorium; a prize that is given to companies, entrepreneurial associations, industrial districts and organisations that are engaged in concrete projects of corporate social responsibility and sustainability, in line with declared values. The Ninth Edition of the Prize saw the participation of 206 companies with 251 projects. The jury, chaired by Lorenzo Ornaghi - Rector of the Università Cattolica del Sacro Cuore - selected A2A among the 6 finalists in the category "environmental initiatives". A2A submitted the project "contAgio", developed in 2009-2010 in collaboration with the Cooperative Cauto (and with the support of Cariplo Foundation) with the aim of making students, young people and families aware of the sustainable use of energy resources in ten pilot municipalities of the north-east of Brescia. In conjunction with De Agostini, Aprica created a DVD dedicated to first grade primary and secondary schools with the name “RECYCLES - Waste is converted”, an imaginary journey in the world of refuse to discover the benefits of differentiated collection and recycling. Presented at the XVI edition of the Mediastars competition, the DVD was awarded the Specialstar prize for direction in the Audiovisual Techniques section. A competition organised by sector associations connected with district heating and cogeneration to reward and facilitate the exchange of information between operators on subjects relating to environmental and energy saving solutions. A2A Calore & Servizi was awarded the certificate of merit for its Canavese cogeneration power station which is based on the cogeneration associated with a heat pump having a power of 15MW which uses underground water for heat production. A2A scored for the third consecutive year, the European recognition " CEEP CSR Label", confirming the only company to be awarded in all three editions. This award, promoted by the European Commission and the European Centre of Employers and Enterprises providing Public Services, is an integral part of the Discerno Plus project set up to encourage social responsibility in the European Union and demonstrates that the Group, in developing their business, enhances the relationships with the local community, its customers and the environment. In the frame of the "Bibliothèque Solvay” in Brussels, Riccardo Fornaro, “Social Responsibility and Web“ manager, received the " CEEP CSR Label“, a recognition for companies which distinguish themselves in applying European corporate social responsibility standards. from waste to energy plants through the new low NOx emission burners with "Dry Low NOx 2.6 +". A2A has also been reported, as "Best CSR Practice in Public Services“, for the establishment of a intervention group for emergencies like the A2A Civil Protection Group. The Jury of the Balance Sheet Oscar, the prize promoted and managed by FERPI Award - Italian Public Relations Federation - has selected A2A as a finalist for 2010. A2A has been included among the top three companies for the Balance Sheet Oscar for Companies and major listed concerns seeing that, "despite the typical complexity of these organizations, has succeeded in presenting complete and comprehensive reports, with attention to issues such as sustainability and governance and with a graphic and editorial design that enhances transparency and conciseness." On July 27, 2010 AMSA obtained the Certificate of the "Code of Practice - Safety of Road Management System (SSA)" for the activities of "Planning and effecting of transport services for third parties of non-hazardous and hazardous waste ". Because these activities are already included in the Integrated Management System QES (Quality - Environment - Safety) applied within AMSA, the certification of the Code of Practice has made it possible to highlight the safety aspects of the service supply of waste transport. The initiative was part of a pilot scheme of the Ministry of Infrastructure and Transport (Transport Branch-Central Committee of the National r Haulage Register) for the promotion of voluntary certification systems for road haulage safety, which AMSA joined in January 2011. 50 companies were included within the project, specialized in the fields of road transport of dangerous goods, perishable foodstuffs, pharmaceuticals and industrial waste. The audit, conducted by a certification body recognized by the Ministry, allowed the inclusion of AMSA (14 ° Company in Italy) in the specific list of companies certified in the National Register Site of road haulage contractors. Golden arrow for the category "Business Services Public" and Golden arrow for the strategy category "Integrated communication" are the two major awards won during the campaign "Stay with us", which from October to December 2009 arrived in the homes of A2A customers by direct personalized marketing and a series of integrated and multi-channel communication campaigns: posters press radio, TV, web and local events. The prizes were awarded to the best direct marketing campaigns, digital and promotional marketing and, in general, relational marketing effected during 2009 and until March 2010. In 2010 the Energy Observatory-Cerved of Databank Group examined a sample of gas and electricity customers in the territory of Milan and Brescia, differentiated between domestic customers and customers with VAT and SMEs, which confirmed positive findings, and in several cases improvements compared to the previous year. The major market participants were involved for each of the four groups and the questionnaire was sent to 300 customers per group. The survey was conducted to measure the degree of customer satisfaction in relation to major competitors, expressed by the CSI (Customer Satisfaction Index) and the perceived level of awareness of advertising and information messages sent. On the basis of information produced five outstanding companies have therefore been awarded for the quality of their business relationship with clients, including A2A. The BICSI Energy Award is a confirmation for all group companies that deal with relationships with customers and is in line with the investigations conducted by the Authority for Electricity and Gas, the highest authority in the field. The portal “Scelte Sostenibili” (Sustainable Choices) has selected Ecodeco, a company of the A2A Group, as a model of Sustainability. This portal, one of the most authoritative in its field, provides information about environmental sustainability with specific reference to key issues relating to Expo 2015 and is organised by the AGI (Agenda Giornalistica Italiana - Italian Journalist Agency). “Working with waste? That means improving the way it is managed and also our lifestyle” is the title of an interview given by Sergio Testa, the production manager at Ecodeco who has described to Scelte Sostenibili what it means to work with waste and the opportunities for the future to be found in this field. The “Friend of the environment innovation prize” awarded by the Environmental League is an annual award given for innovative technologies, services and management systems that lead to environmental improvements. Above all it represents the recognition of initiatives whose results can be checked in the short term and which stand out for their originality and potential. The prize is given for innovative ideas developed in green technologies, eco-building and green procurement. A2A received its award as part of the green technologies section with the project “The development of district heating: the use of water table heat pumps"
CMMCIt was one again the wish of CMMC (Customer Management Multimedia Competence) this year to give recognition to the companies and people who have stood out for the work they have performed with customers and residents. The following explains why a prize was awarded to Silvia Intra. “She has managed customer care in AMSA skilfully and passionately since 1997.Very attentive to change she is convinced that in the company she works for one feels increasingly less in a protected market and increasingly more in a competitive environment, and that accordingly service quality and brand strength must be kept at a high level by establishing loyalty in the customer-resident. In addition she keeps up with innovations such as the internet discussion forums regarding the differentiated collection of waste and the cleaning and decorum of the city. Thanks to her commitment and the emphasis she places on the staff working in this area, the role performed by the Amsa customer centre in its day to day dialogue with residents and awareness of the city’s needs stands out in particular”. On the basis of information produced by the Energy Observatory and the SME Business Panel© Energia, five companies were awarded a prize for the excellence of the quality of their commercial relations with customers. A2A won for having the best customer satisfaction performance in all the energy market segments analysed. The BICSI Energy prize acts as confirmation for all the companies of the Group that are involved with customer relations and is in line with the surveys carried out by the Electricity and Gas Authority (AEEG), the leading authority in the sector. satisfaction: 12.3 points above the national average. In particular, 92.5% of A2A’s clients were satisfied with the Group’s “ability to solve resolve problems in the shortest time possible”: 16.3% points above the national average for the sector. A constant commitment aimed at the real needs of the customer that leads to results that bring great satisfaction to everyone making a contribution. A2A has been awarded the CEEP label, the European recognition for company social responsibility, conferred on companies that distinguish themselves in the application of European standards. Promoted by the European Centre of Companies of public utility service, the Prize is an integral part of the “Discerno” project within the framework of the European Union that promotes, activities of social responsibility. As a result of a detailed analysis, leading experts in the CSR field have recognised the extensive commitment of A2A, on a voluntary basis, to integrate the social and environmental standards in their own activities. The prize, which had the backing of the President of the Republic, was conferred on companies that had distinguished themselves particularly for activities and plant that bring about significant environmental benefits, that have an innovative content, positive economic and employment effects and a dissemination potential. The awarding of the prize, that took place within the ECOMONDO, the large annual trade fair dedicated to GREEN ECONOMY, has the aim of promoting and making known the positive initiatives of Italian companies and encouraging the dissemination of their good practices and technology. The Aprica plant, puts into effect the principles contained in the Community Directives, both regional and provincial, by providing for the reduction in waste to be sent to rubbish tips and lending substance to the principle of environmental sustainability, carrying out recycling processes of over 60% of the incoming waste. It was for these characteristics that it was awarded the prize in the waste sector. The capacity of the plant in Brescia is 30 thousand tons of incoming waste per year. Safe Company Prize "best training"
Friday 29th May, in the Conference Room at the Brescia Trade Fair, A2A was rewarded for the best training on safety in the EXPO Sicuramente event 2009. The Safe Company prize, reserved for private and public companies and onlus operating in the province of Brescia, was promoted by the Brescia Trade Fair in collaboration with the Brescia Chamber of Commerce and AIFOS (Italian Association for Safety Instruction). The event, which takes place every two years, was born with the objective of rewarding operators that undertake to invest resources and personnel to make the working environment safer both for employees and for customers. A2A was particularly appreciated for its articulated training programme which in 2008 involved the personnel in 13,452 hours of training, subdivided into fire fighting, first aid and other themes for an average of three hours per person. Thanks to training, to improvement in processes and organisation, A2A has been able to confirm the trend in the reduction of accidents which, in 2008, reduced by 7% compared to the previous year. The commitments of A2A as regards quality, environment and safety and thus the sustainable development of their own activities, are contained in the Policy for Quality, Environment and Safety , the document that lays down formally the specific objectives of the Group in line with those fixed by the international regulations Uni EN ISO 9001-14001 and OHSAS18001. Carlo Ansaloni – Head of the Safety Group A2A, collected the prize for A2A within the Management of QAS. WTERT selected firstly twenty plants throughout the world, among which it chose the ten best, 6 European and four American. Among the three finalists, the absolute best was the waste to energy of ASM; at second place was the new Swedish plant at Malmö, at third place Amsterdam. The Confservizi Quality Prize is assigned to the company that performs actions and strategies aimed at the promotion of practices of social company responsibility. In 2006 the ASM Group, being among the five companies that have achieved the greatest number of points. With the conferring of this recognition, the organisers intended to underline the importance of consolidation of system cultures and the integrated use of management regulations of quality with those ethical and environmental and the safeguarding of health and safety in the work place. For the awarding of the Prize various company requirements were evaluated relating to themes of quality, the environment, safety and social. Apart from the participation in the Prize, in the 2005 version there was also introduced the possibility for the companies to apply for three best practices regarding: technological innovation at the service of the citizens and customers, managerial innovation aimed at the participation of the employees; the adoption of company policies aimed at the affirmation of social and environmental responsibility. Only the companies that exceeded 50% of the maximum points in the first session were eligible for candidature. Asilo nido ASM: Premio all'Innovazione Amica dell'Ambiente 2006In 2006 the company nursery received the Prize for innovation Friend of the Environment, an institute of Legambiente and the Lombardy Region and has reached the sixth edition. This is a recognition of the technologies, processes, products services and innovative management systems that produce significant environmental improvements “the purpose of the Prize is to create a favourable context for research and the exchange of innovations in the ecological field, rewarding those capable of considering that the environment is no longer a restriction but as a value and opportunity for development and growth for oneself and for the entire community”. ASM participated in the Prize introducing the company nursery with the category “the home and living”, aimed at the development of solutions projected, technological and organisation of services, able to join the attention to the environment and energy consumption with the care of design and good living, in particular the nursery obtained first prize in the section “Energy Houses in Lombardy”, since buildings with bio-architecture, energy saving, environmental quality, safety and managerial efficiency were looked after to guarantee families a high standard of service. During the presentation of the Energy Observatory 2008 results, illustrated by Customer Asset Improvement - CAI (former division of the market research Databank) which took place on February 26, 2009 A2A was awarded with the "BICSI ENERGY 2008" Plaque. The award acknowledges the achievement of A2A’s particularly positive performance in customer satisfaction in the various segments of the energy markets, particularly in the sale of electricity. In order to deepen the level of customer satisfaction and to compare the operators as regards performance with market standards and with those of major competitors the Cain Energy observatory, offers a comprehensive system of indicators for "quality of customer relations" based on two columns, the Customer Satisfaction Index CSI and the NPS Net Promoter Score (ie, satisfaction and word of mouth). Ecodeco, active in the Waste and Environment is the only European company in the sector rated the highest in the category "Production of fuel from waste" by the prestigious British consultancy Juniper Consultancy Services, a leading independent UK-based consultancy specializing in the analysis of available technologies and those of the market in the environmental field, that has published the "Juniper Rating Report" relating to providers of treatment systems of municipal solid waste MBT (Mechanical Biological treatment) and MHT (Mechanical Heat treatment). The report is a guide to help identify companies operating in the sector by classifying them with a point system. Five stars and Fully Proven are the points awarded to Ecodeco for the technology used in the ITS (Intelligent Transfer Station) already implemented in Italy and the United Kingdom, and for its organization: factors which enabled the company to be listed as a leader in bioessication sector and production of secondary fuel from waste. There are 36 companies that have the right to use the CEEP/CSR LABEL, that is, the certificate that testifies that the standards laid down by European regulations have been reached. Only 5 of these companies deserved a mention by the scientific committee formed by representatives of the UNITED NATIONS, THE EUROPEAN COMMISSION and OCSE. The seventh national Conference on Quality saw the awarding of the third Quality Confservizi prize at ARA PACIS, on 14th November 2007 Conference and Quality premium constituted an important stage in the path taken during these years by Confservizi and the recognition of the most innovative and efficacious methods by which these policies were followed. The Third Quality Prize 2007 concentrated particularly on the subject of social responsibility of the company (CSR), conceived as the envelope containing policies and instruments of quality integrated in a multi-stakeholder approach, continuously gathering together as distinct from the previous prizes and considering the aspects directly connected to the policies and quality instruments adopted and their innovative content, with a view mostly directed at the dimension of the integrated quality. For each of these themes the examining Committee drew up a classification and determined for each one three runners up and a winner. The runners up participated in the awarding of the Quality Prize on the basis of a questionnaire relating to integrated quality. AEM represents the Best Practice of the system above all because it was able to unite an important commitment to the traditional “quality system” with that of integrated management “quality – environment – social responsibility of the company”.